Engineers from North Korea and seven other nations are being given training in technology related to China’s Beidou (Compass) satellite navigation system this week, according to Chinese media reports. The engineers are attending a course in Hubei province being put on by the National Remote Sensing Center. The organization is part of China’s Ministry of Science and Technology and is charged with development of the Beidou system. Beidou is a satellite navigation system developed to reduce Chinese reliance on the U.S. Navstar Global Positioning Satellite (GPS) system. It’s one of several new satellite navigation networks being launched to supplement the American system. Satellite navigation has become so important to defense and global trade that countries worry about the economic or military impact should the U.S. block access or the system suffer a failure. In addition to the North Korean engineers, representatives from Thailand, Malaysia, Pakistan, Brunei, Indonesia, Cambodia and Laos are also in attendance, said Xinhua. 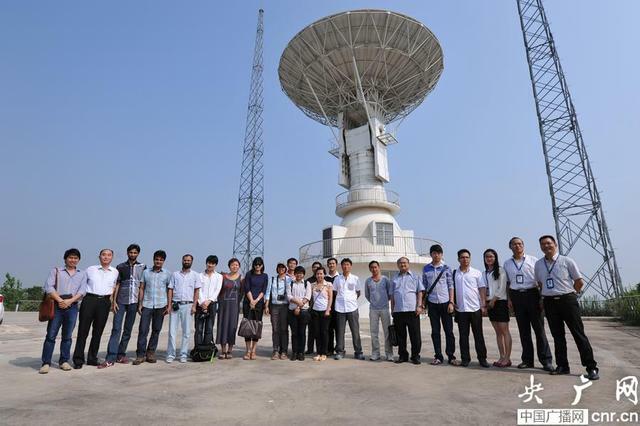 As part of the training, they visited China’s largest remote-sensing satellite ground station, pictured below by Xinhua. GPS technology is embargoed from being taken into North Korea. The country doesn’t want its citizens to have accurate satellite navigation technology and North Korea’s neighbors don’t want the country’s military to obtain the same. The Korean Central News Agency has yet to report on the visit. 1 Comment on "North Koreans learn about China’s Beidou satellite navigation system"
Side note: Beidou 北斗 is actually the Chinese name for Polaris, the Polar star.